Pasturas Los Alazanes has a great selection of food for your pets. 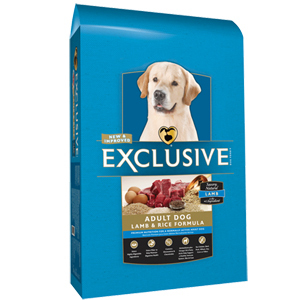 We carry a number of top pet food brands including PMI Nutrition, Exclusive, and Red Flannel. We want to make sure that when you shop at Pasturas Los Alazanes, you truly get the best at the best price. We are now proud to offer a Pet Food Loyalty Program on Red Flannel Dog Food. When you buy 8 bags of Red Flannel Dog Food, you get your next bag free. This is our way of saying thank you to our loyal customers. If you would like to view our selection of pet food, then please click here. Here at Pasturas Los Alazanes, we are committed to making sure you find exactly what you are looking for. If you have any questions about the great pet food that we offer, then please do not hesitate to call (972) 557-1344. We will be more than happy to answer any questions you may have.